The Challenge of….the Superfriends! Episode 1 – Wanted: The Superfriends. So in achieving a somewhat dubious milestone yesterday – turning 51 – I received a special DVD set, one that contains significant wisdom and lessons for our future – the first season of Challenge of the Superfriends, circa 1978. A classic in renowned, highly regarded animated cinematography, this series not only challenges our intrepid heroes of series seen earlier in the 70s (DC Comics heroes such as Superman, Batman, Wonder Woman, etc. ), but challenges many aspects of the viewer’s sense of reason and world view, to boot. For you see, not only are our heroes confronted with the biggest assortment (well, as of 1978, anyway) of ‘super’ villains in one place, at one time (the Legion of Doom), but commensurate with this threat, both our heroes (and the viewer) now is threatened by a set plots and one-liners both ridiculous and entertaining at the same time. Together, dear reader, we will now examine these episodes under a closer lens, providing scrutiny, skepticism, and comic relief where needed, as needed. We begin with Episode 1 – Wanted: The Superfriends. 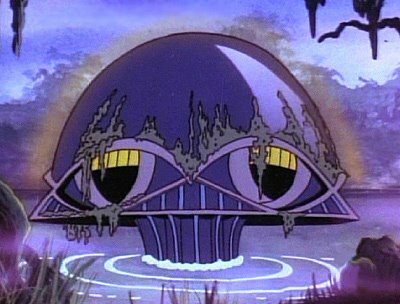 As always with these shows, it opens with the usual shot of the Hall of Doom rising out of a remote swamp somewhere. As this is the first episode, Lex Luthor sets the stage by introducing all the villains in the room, some of which who show off by blasting out a lamp (Captain Cold); creating a huge, levitating snake (Sinestro); smashing a huge hole in the table (Solomon Grundy); and scratching huge gouges in the same table (Cheetah). So already they’re causing societal damage! And of course Luthor introduces himself in the third person as the most intelligent and dangerous of them all, natch. He then proceeds to show off a hovering, dronelike ‘dream gun’ that he uses one by one to infect the Superfriends’ dreams so they will commit crimes and get blamed for it (of course). They then show Flash ripping off Big Ben and the British Crown Jewels (apparently just running by the cases at super speed is enough to get them); Black Vulcan takes all the sarcophagi and treasures from The Great Pyramid in Egypt, and Wonder Woman lassos (really?) all the paintings out of the Louvre, among other crime sprees. Cut back to the Hall of Doom, and the Legion of Doom with a couple scenes of gloating, then to the Hall of Justice, with the Superfriends discussing (in fairly nondescript, objective ways despite now being ‘super criminals’?) their crime sprees of the night before with Hawkman pointing out the gold and other crap in a storage locker. Hmmmm.. But it gets better. The ‘police’ now ask them to turn themselves in – but it’s not really the police – it’s Cheetah and Bizarro, who (after the requisite gloating – I think we’re seeing a pattern here) – press a button on what looks like an oversized 70’s TV remote, and a mind-control ray kicks in to immobilize them (save their ability to complain) and then the jail cell (literally) blasts off, headed into orbit, straight for the sun (yes, you heard both of those right). Cut back to the Hall of Doom, for the obvious cliffhanger, begun by yet another round of Luthor gloating, then Black Manta leading off to take the Hall of Justice (and rename it the ‘Hall of Injustice’ – apparently the Hall of Doom isn’t good enough) so they can then use the Justice League computers to REALLY amp up the crime spree themselves! Cue the announcer ‘can the Superfriends escape…?’ etc. Resume with the second act – while the Superfriends continue their space-based whining as they plunge towards the sun (while I’m still wondering what air they are breathing and how the Legion of Doom managed to get a rocket-powered jail cell capable of travel all the way into orbit and the sun built into a local Washington DC jail in advance of capturing them, but these are minor details) Luthor (after yet *another* round of insults at the SF’s expense – ‘Superfools’ seems to be a crowd favorite) hooks up some ridiculous mind control device to the computer, which then hooks in the Justice League Satellite to beam rays all over the Earth and turn everyone (?!) into Cheetah and Bizarro clones, who then proceed to rob literally ‘everything’ (I’m not kidding) and turn it in to the Legion of Doom, now camped out in the Hall of Justice. But our heroes aren’t beaten yet. Superman spots a meteor nearby, and Wonder Woman saves their asses by mind-controlling her magic lasso to adjust the rocket to make the jail cell collide with the meteor, knocking off the Doom control device. Then Superman jumps out into the vacuum (which I realize doesn’t affect him but what about the rest?) and steers the jail cell back to Earth. Superman, Batman and Robin (Batman looking fairly fat as he runs along with them, apparently his time in jail wasn’t calorie-challenged), seeing a bunch of Bizarros standing on the lawn, objectively evaluate the situation in a matter of seconds (smart) and then Superman takes on the Bizarro-driving some big street sweeper truck who is attacking them (Bizarros apparently forget that Superman could actually fly OVER such a truck). But Superman cuts them a break and uses his arm (with requisite Skil-saw sound) to disable the sweeper brushes – then verbally admonishes the Bizarro, and flies him over to a phone booth and eye-laser seals him in. In typical illogical fashion, the Superfriends now spend their time flyins all over the place trying to prevent more crime (instead of of just going to the Hall of Justice to stop Luthor directly) – this despite Superman already having **said out loud** what the likely cause was in the previous scene (a Luthor mind control device)? No prize for brains in these cinematic masterpieces, to be sure. We now see Batman and Robin in the Batcave, running endless calculations on the Batcomputer to “figure out what’s going on” (again, see previous comment) – Robin notes they are low on power, and his a button to ask Alfred for a ‘nuclear power pack’ (yipes) – but excellent plot twist! Alfred is a Bizarro now, and mid-series of one liners, attacks them with a double-electric lasso, then explains (after throwing them in the Batmobile) how he’s set it to drive them off a cliff (cue maniacal laugh). It blasts out of the cave, Robin starts the inevitable whining, but despite them flying off the cliff, Batman hits the rocket button somehow in his belt and the car blasts upward into the air. Cut back to the Hall of Justice for yet another round of gloating by Luthor, Captain Cold and The Riddler. Then, Batman and Robin (now safe and driving around in the country somewhere) complete the ‘calculations’ on the Batmobile mini computer – a dot-matrix computer printout tells Robin how to fix the problem (on Bat-paper? ), and radios Superman, who, using a huge walkie-talkie, answers and then heads into orbit to fix the satellite. After he jiggles the satellite around a bit, Superman calls Batman back on the same Radio Shack walkie-talkie – which apparently works well even in space – to tell him to now go after the Legion of Doom (phase 2). The Superfriends sneak back into the Hall of Justice disguised as Bizarros and Cheetahs (carrying more money), then the inevitable final battle (which is mostly comprised of one-liners yelled at one another) begins. Bizarro (literally) wraps up Batman and Robin with a steel girder he rips down from the ceiling, but Batman makes a snide comment and casually lobs out his Batarang, which loops back and saws through the girder, then shoots some sort of ‘plastic bag’ at Bizarro, who gets caught AND has to endure more taunting from Batman to boot! Ah, but the inveitable conclusion, something of an anticlimax – Luthor, yelling more threats, tries to use the mind-control drone on them again, but Superman grabs him and then aims it at the Legion of Doom, who supposedly go to jail. But then when the Superfriends are sitting around later, patting themselves on the back, Luthor appears on the big screen and brags yet again how they have escaped, and how they are already back at the Hall of Doom, planning more crimes! Superman of course gets in the last word, warning them they won’t succeed. Whew! Posted in Uncategorized | Comments Off on The Challenge of….the Superfriends! Episode 1 – Wanted: The Superfriends. that Jim Henson remains one of the most creative and cool people who ever lived…. So, in response to the big success of Gareth Edwards’ Godzilla film (discussed earlier here) – the original Godzilla film company – Toho – decided to do yet another Gz film of their own. The result: Shin Godzilla, which just came out on DVD and Blu-Ray this month. Funimation, god love ’em, actually did a limited release of this movie in theaters last year(?) – and I went, but like an old loser, fell asleep midway through the movie so missed most of it – doh! So I’ve been waiting for it to come out on DVD so I can actually watch the whole thing through. My take: mixed feelings. So on the one hand, the special effects are definitely in the top tier of any of the Toho Godzilla films – especially when the earlier mutant version of Gz is waddling through down (there is no other way to describe it) and crushing boats, rivers, trains and buildings – very, very realistic looking, even if Gz doesn’t look very dangerous at that point – yet. But then on his second run of destruction through town, the battle is a bit too drawn out (timewise) even if a bit too abbreviated (battle-wise). You see, the filmmakers are obviously putting in a lot of human commentary on Japan’s current political situation – the first half hour of the movie if not a bit more is spent spoofing meeting, after meeting, after meeting, at the govt level and how they are ‘paralyzed by process’, even when faced with a giant mutant nuclear-fired monster is about to stomp their country into oblivion. While this setup is funny at parts, it drags on a bit too much – bring on the monster! My other minor/major gripes are two – Godzilla himself looks like he’s wearing a weird chest-jutting haltertop underneath his skin when he finally assumes the role he was born to do – his upper body is just weird looking. His skin looks much closer to General Tsao’s Chicken than the usual scaly, rubbery mutant we know and love, and most egregious – his roar is severely muted, if you hear it at all. This last was largely my big gripe for the Gareth Edwards film, likely because he probably couldn’t license the sound, but Toho OWNS that roar – hel-lo? Also, as you see in many Gz movies, they play up the ‘sympathy’ angle more than a bit – especially when the military is (literally) dropping buildings on him left and right. In the older movies when this happens, he really gets pissed off – and to some degree that happens here, but we never really see the big ‘rage moment’ that happens at least once or twice in the older movies. Disappointing – I wanted to see more destruction! The actors are good otherwise, although the ‘americans’ mostly appear off camera with pretty stilted dialogue. And the notion of a Japanese-American woman becoming President by her 40th bday is fine by me, bring it! So I think in the end the movie is definitely worth watching but a bit too long and not enough Godzilla. I think on balance still my fave movie is Godzilla 2000 – easily the scariest looking Gz in any of the movies, definitely among the most badass, especially at the end. Posted in Uncategorized | Comments Off on Shin Godzilla! Posted in Uncategorized | Comments Off on RIP, Caped Crusader…..
well worth the wait! But was only able to see the first 3 episodes….hopefully goes on all summer! Posted in Uncategorized | Comments Off on Oh….Jack…! made my day. Thank you Genndy!!! Posted in Uncategorized | Comments Off on So….AWESOME!! Finished this animated series a few nights ago. I have to say, this was overall a very good series. There were a few minor flaws, but for the most part it was very good on character development, creating real conflicts in and around the variety of personalities they present, and not being above injecting humor throughout, but not in a completely ‘kids’ way (Superfriends, i’m talking to YOU). To me, there are essentially 3 kinds of animated shows. 2) Animation that masks itself as kids stuff but tries to also play to adults either directly or indirectly, sometimes even as a smirky way to increase viewership – I’d put nearly all Pixar’s output in this realm, even though a few of their movies of late have really lowered the bar (anything with *cars* in them comes to mind); a lot of modern anime is also here; and more ‘serious’ stuff like Samurai Jack, TRON:Uprising, etc. 3) Animation that obviously intends to be for adults directly – either because of certain subject matter (we really, really don’t have to go there, but sadly it exists) or because the show in the end is actually the same as a live-action show would be, but for whatever reason (set in the future, deals with fantasy, horror, unrealistic or science-fiction type stories and/or technology – even production cost) is an animated show. I’m not going to count animation that is essentially glorified commercials for toys (TMNT, much of Transformers, and the list goes on) – not. The Legend of Korra is squarely set in (2). While it’s effectively a sequel series to Avatar:The Last Airbender, it goes in its own way to try to entertain and teach at the same time – but despite the fact that there may be slightly *too* many crises throughout the four Books of the series, it never talks down to its audience, and I was pleasantly surprised time and again with the way it handled the characters and dialogue. And unlike many recent comic book movies or similar multiyear series – it really doesn’t have glaring plot holes that take the viewer out of the story due to simple logic failure. It’s definitely a long series (52 episodes) but in the end, it’s definitely worth it. I only wish other equally good or better series (TRON:Uprising and Sym-Bionic Titan) had received an equal level of network support and promotion (both only had one season). And the far quirkier earlier Invader Zim – same deal. but watch it – you won’t be disappointed. Posted in Uncategorized | Comments Off on The Legend of Korra.